TACOMA, Washington, April 18, 2017 (ENS) – The retreat of a massive Canadian glacier has triggered the first known case of “river piracy” in modern times – the capture of one river’s flow by another river. The giant Kaskawulsh Glacier in northern Canada has retreated about a mile up its valley over the past century, due in part to climate change. Last spring, the Kaskawulsh Glacier’s icy toe, which was sending meltwater toward the Slims River and then north to the Bering Sea, retreated so far that the Slims River changed course. It joined the Kaskawulsh River and began flowing in the opposite direction – south toward the Gulf of Alaska. “Geologists have seen river piracy, but nobody to our knowledge has documented it happening in our lifetimes,” said Dan Shugar, a geoscientist at the University of Washington, Tacoma. “People had looked at the geological record – thousands or millions of years ago – not the 21st century, where it’s happening under our noses,” said Shugar. River piracy, also known as stream capture, can happen due to tectonic motion of Earth’s crust, landslides, erosion or, in this case, a change in a glacial dam. Shugar and co-authors Jim Best at the University of Illinois and John Clague at Vancouver, Canada’s Simon Fraser University had planned fieldwork last summer on the Slims River, a geologically active system that feeds Kluane Lake in Canada’s Yukon Territory. When they arrived in August, the river was not flowing. River gauges show an abrupt drop over four days from May 26 to 29, 2016. The research team got permission to use their mapping drone to create a detailed elevation model of the glacier tongue and headwater region. Their resulting paper is a geological postmortem of the river’s disappearance. “For the last 300 years, Slims River flowed out to the Bering Sea, and the smaller Kaskawulsh River flowed to the Gulf of Alaska. What we found was the glacial lake that fed Slims River had actually changed its outlet,” Shugar said. 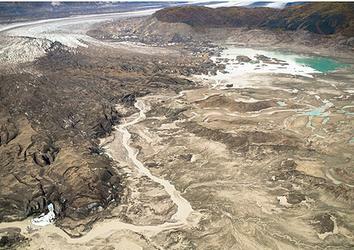 “A 30-meter (100-foot) canyon had been carved through the terminus of the glacier. Meltwater was flowing through that canyon from one lake into another glacial lake, almost like when you see champagne poured into glasses that are stacked in a pyramid,” he said. That second lake drains via the Kaskawulsh River in a different direction than the first. The situation is unique, Shugar said, since the glacier’s toe was sitting on a geologic divide. Clague began studying this glacier years ago for the Geological Survey of Canada. He observed that Kluane Lake, which is Yukon’s largest lake, had changed its water level by about 12 meters (40 feet) a few centuries ago. Clague concluded that the Slims River that feeds Kluane Lake had appeared as the glacier advanced, and a decade ago he predicted the river would disappear again as the glacier retreated. The geologic event has redrawn the local landscape. Slims River crosses the Alaska Highway, and its banks were a popular hiking route. Now that the riverbed is exposed, Dall sheep from Kluane National Park are making their way down to eat the fresh vegetation, venturing into territory where they can legally be hunted. With less water flowing in, Kluane Lake did not refill last spring, and by summer 2016 was about one meter (39 inches) lower than ever recorded for that time of year. Waterfront land, which includes the small communities of Burwash Landing and Destruction Bay, is now farther from shore. As the lake level continues to drop, researchers expect this will become an isolated lake cut off from any outflow. On the other hand, the Alsek River, a popular whitewater rafting river that is a UNESCO World Heritage Site, was running higher last summer due to the addition of the water from the Slims River. A technique published in 2016 by University of Washington co-author Gerard Roe shows a 99.5 percent probability that this glacier’s retreat is showing the effects of modern climate change. Other co-authors are Christian Schoof at the University of British Columbia, Michael Willis at the University of Colorado and Luke Copland at the University of Ottawa. The study was funded by the University of Washington Royalty Research Fund, Parks Canada, Yukon Geological Survey, the Natural Sciences and Engineering Research Council of Canada, the University of Ottawa and the University of Illinois.